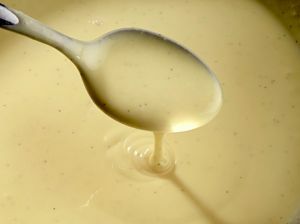 Crème Anglaise is a light pouring custard used as a dessert cream or sauce. It is a mix of sugar, egg yolks and hot milk, often flavoured with vanilla. Romans who used eggs as thickeners to create custards and creams. Its name may derive from the prevalence of sweet custards in English desserts. The cream is made by whipping egg yolks and sugar together until the yolk is almost white, and then slowly adding hot milk, while whisking. This process is commonly referred to as tempering. Vanilla beans may be added for extra flavor and visual appeal. The sauce is then cooked over low heat (excessive heating may cause the yolks to cook, resulting in scrambled eggs) and stirred constantly with a spoon until it is thick enough to coat the back of a spoon, and then removed from the heat. It is also possible to set the sauce into custard cups and bake in a bain-marie until the egg yolks set. If the sauce reaches too high a temperature, it will curdle, although it can be salvaged by straining into a container placed in an ice bath. Cooking temperature should be between 70 °C and 85 °C; the higher the temperature, the thicker the resulting cream, as long as the yolks are fully incorporated into the mixture. This can be poured as a sauce over cakes or fruits. Alternatively, it can be eaten as a dessert on its own, for example in Île flottante ("floating island"): the cream is poured into a bowl with a piece of meringue floated on top along with praline. It can also be used as a base for desserts such as ice cream or crème brûlée. It has a mild taste but a rich, and thick vanilla flavor.